Anderson Cooper and John Berman filled in for Jake Tapper and co-anchored The Lead from Baltimore on Wednesday. ... stayed on for a few minutes to talk to Don Lemon on CNN Tonight. Please check back tomorrow as we will be posting some video of Anderson's interviews. 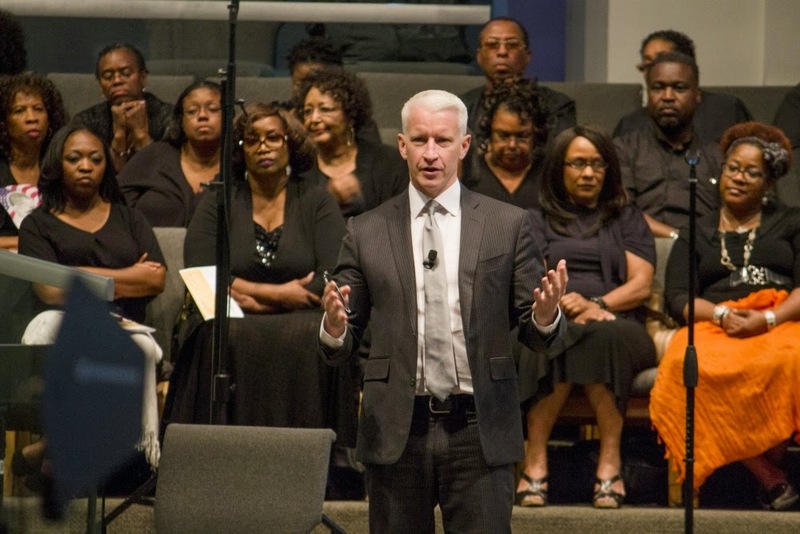 Anderson Cooper came to Phoenix on Saturday, April 24th, at the invitation of Arizona State University’s Center for the Study of Race and Democracy. The afternoon was billed as a discussion on diversity, which is a very timely and important topic for all of us, especially those in the African American community who made up a large part of the audience. 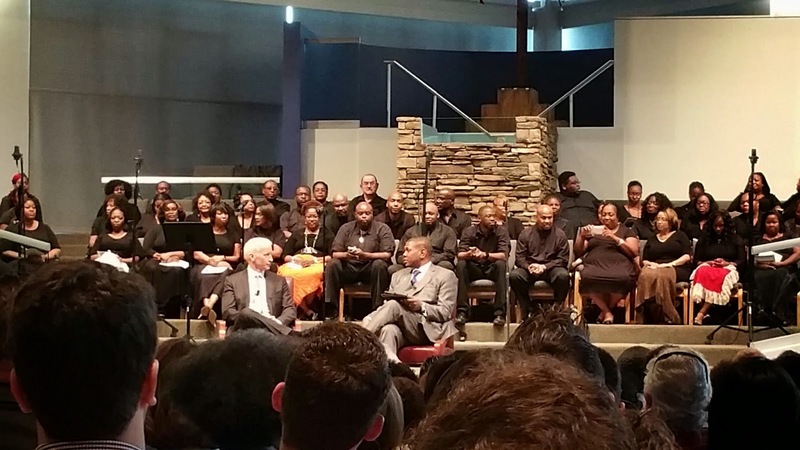 The event was held at the Pilgrim Rest Baptist Church in downtown Phoenix. This is no ordinary church, its outreach broadcasts are watched by thousands of people each Sunday and the sanctuary seats 2,500 worshipers. But as impressive as that is the choir is the crowning jewel of this ministry, in my opinion. They shared their talents with the audience on Saturday, singing ‘We Shall Overcome’ along with several other selections before Anderson spoke, getting the event off to a rousing and inspiring start. The audience for Cooper’s appearance included church members, college students, members of the community, elected officials and the ever devoted AC fans. The common denominator among attendees was community improvement and understanding why police violence toward men in the AA community repeats in every news cycle these days. On this subject Anderson said he thinks that this violence is nothing new (a fact to which many in the audience could attest) but we hear more about it now because cameras are everywhere. He praised the young man in South Carolina who was brave enough to keep his cell camera rolling as Walter Scott was murdered by police. He also talked of how he spent time with Scott’s mother and family, privately with cameras off, as they prayed and grieved for their lost loved one. He marveled at their strength and grace. Several local notables, including Phoenix's mayor Greg Stanton, made opening remarks. Mayor Stanton mentioned that he had briefly switched to MSNBC but was back to watching CNN. Later AC's remarks included his memorable line about why would anyone want to be a blown dry anchor or a politician….why be a fake person when you can be a real person? And then without missing a beat he apologized to the Mayor but said he had it coming for the MSNBC remark. Anderson went on to mention a few more of his stock talking points, fake press pass, wear vertical stripes, his time roaming Africa, losing his father at a young age and then his brother’s suicide. He also laughed at his useless focus at Yale on Communism (the Berlin Wall fell right before his senior year) and other stories most ATA readers are familiar with. He limited himself to this brief introduction before turning the program over to Dr. Matthew C. Whitaker, the director of CSRD at ASU who led a discussion with Anderson that was interspersed with questions from audience members. There were no personal questions, I should note, everything stayed on topic focusing on civil rights, diversity and democracy. One question of note was a Native American student from ASU who asked Anderson’s opinion on the situation with Native Americans in our country. AC admitted he was not familiar with this issue and realized he needed to learn more so he would educate himself starting on Monday. Since AC couldn't answer her question she got a follow up and asked his opinion on the controversy over using Native American objects and nicknames for team mascots, i.e. Redskins, Braves, etc. AC talked around the question for a while and then personalized it by saying he wouldn't like it if a team were named the New York Fairies. It brought a laugh but he expounded upon it and related prejudice against gays to other minorities’ struggles. Anderson said that he knows many effeminate gays and the great hardships they are subjected to. From being ostracized, beaten up, mocked and worse their lives aren't easy. He went on to say he was lucky because he could 'pass' (meaning it's not as obvious he is gay). He said society perceives effeminate gays as weak but they are some of the strongest people he knows because of what they've endured. It was a very touching moment and a viewpoint that you don't often hear. Anderson mentioned he did not have kids and then a pause and added …….yet. An ASU professor shared that when he told him mother that AC was the keynote speaker this year she said ‘my baby Anderson?’. The professor feigned jealousy and told us that he thought he was the only person on this Earth that his mother called baby. He also referred to Anderson as a brother from another mother a few times, which seemed to please Mr. Cooper. At the beginning of the program it was mentioned that Saturday was the Nerd Prom (White House correspondents dinner) in Washington, DC. The speaker said we were lucky that Anderson choose to come to Phoenix instead of going to be with the POTUS. I had to chuckle because AC hasn’t gone to the Nerd Prom since the early 2000’s when Paula Zhan forced him to dance with her. Another funny moment came when a young lady who seemed to be crushing on this newsman particularly hard (admit it we’ve all been there) asked a question from her balcony seat. She was a cute as could be, tossing her hair and smiling sweetly while he talked. For the life of me I can’t remember her question, just that flirty way she asked it. Anderson talked at length about Gordon Parks and the influences he had on AC’s life. He mentioned Parks friendship with both his parents and implied that there was a very close bond with Parks and Anderson’s mother after the death of Wyatt. He educated the audience a bit on who Gordon was and the many strides he made for all African Americans including being the first Black Life Magazine photographer, the first Black director in Hollywood (Shaft) and other notable mentions. Twitter blew up with pictures of Anderson at this event. If you’re interested in seeing more try searching the hashtags #Democracy15 @CSRDatASU. These are the photos that were posted to social media at the time of the filming in early March.